The Final Week of Country Christmas is Here! The Stetson Country Christmas has been absolutely wonderful. Overland Electric Carts & Wheelbarrows have received plenty of attention and positive feedback. The possibilities with this cart are nearly endless, especially in the equestrian industry. The Overland Electric Platform Combo Cart is the perfect setup for feeding and watering. The custom 24″ W x 22.5″ L platform is perfect for supplements, feed bags, water, hay or other feeding necessities. The wheelbarrow hopper can be loaded with any variety of feed or hay as well. Electric power takes the hard work out of feeding and replaces it with a fun and efficient operation. Current owners rave at the time savings noticed at each feeding. Mucking stalls is a required chore but enjoyed by very few. Spend more time riding and less time cleaning stalls with the 10 cubic foot electric wheelbarrow. The 750 lb capacity of the wheelbarrow ensures that you will never be able to pile enough poop in the cart to overload it. Load it up knowing that with a twist of the throttle you will be on your way out to the dump pile. The spring loaded pin allows for secure traveling and easy dumping. Simply release the pin when you are ready to offload and the bucket easily pivots forward. New shavings do not weight much; however, they do take up a considerable amount of space. 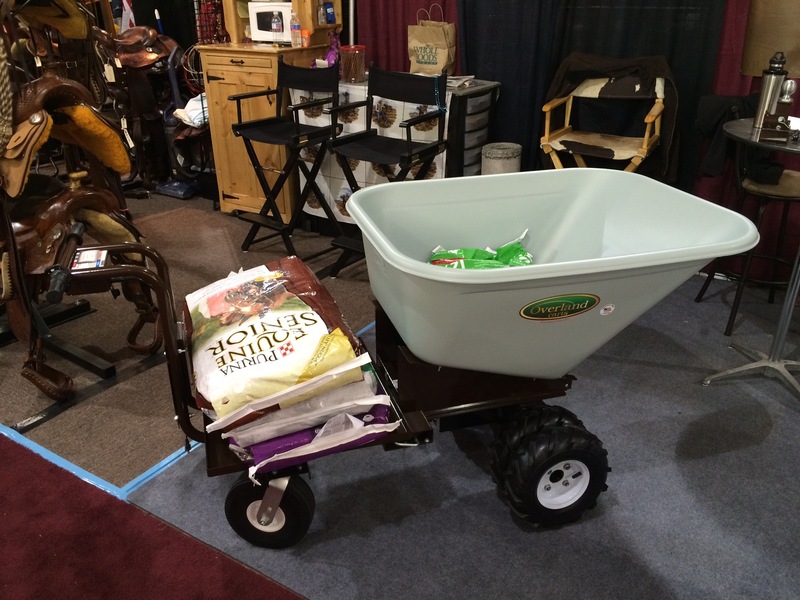 The 10 cubic foot wheelbarrow hopper is nearly double that of most standard wheelbarrows. This allows for maximum volume and fewer loads. The powerful electric drivetrain on the Overland motorized carts adds versatility around the farm. Capable of moving heavy loads up and down hills, the Overland cart can take the place of a tractor for many tasks. This saves the time of getting out a tractor, hooking up a trailer and manually getting up and down from it. The easy-to-use powered cart can be handled by a wide range of ages. Driving a tractor can be complicated and dangerous to an inexperienced user, but an Overland Cart can be safely operated with minimal training. Built in safety features such as automatic shutoff, overload protection, AutoBrake and HillSense work together to create a seamless operating experience. Overland understands the importance of USA made products and components. All Overland Carts are engineered, manufactured, and assembled in the Overland Ohio Plant. The chassis is made by hand from structural steel and then powder coated in house. The buckets are from top USA wheelbarrow manufacturer, Brentwood Industries. The electric motor is sourced from a company in nearby Pennsylvania. We have spoken with many of our current customers, the continual feedback is they use their Overland Carts for EVERYTHING. Once the cart lands onsite, it immediately becomes the most popular utility vehicle available. The robust drive train, huge hopper, and full line of safety features create a desirable combination for any user.